Another long gap in posts: a computer blow-up, a series of crises, a likely house move. And lots of unexpected activities – such as this one. Last summer we visited the remarkable Dilston Physic Garden (near Hexham, Northumberland.) A chance meeting with its maker, the Newcastle University neuroscientist Elaine Perry. A long chat during which my abiding interest in gardens, herbs and medieval culture emerged. The result: she asked me to design a new medieval garden to complement other fascinating areas (Roman, shamanic, Bronze Age, lots more…). 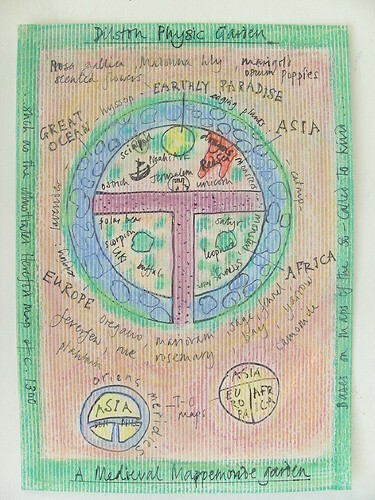 We settled on a circular design reflecting the view of the world around the year 1300. Educated people knew it was a sphere; it was just hard to draw. So my little sketch is based on the schematic T-O map of the time. The Great Ocean, the O, encircles the world (blue plants!). The three continents, Europe, Africa and Asia, are divided by the T of the waters. Paradise (scented plants, lilies) lies in the East, at the top. This entry was posted in All on March 23, 2011 by Jill.